What has been more precious to me than completing the 100km Oxfam Mumbai Trail walk, 2014, in 37 hours? In the cool winter evening of 6 th December 2014, I along with a team of 3, completed the 4 th toughest Oxfam Trailwalk in the world, in 37 Hours. We had embarked on the trail at 6 am on the 5 th of December, 2014, and barring 3 hours of sleep between 3.30 am to 6.30 am on Saturday, 6 th December, kept trudging along. We trudged along mountains, fields and lakesides, in the blazing afternoon sun, through treacherous climbs and tricky descents. But that’s not what this piece is all about, this is more about the lessons I learnt while on this mission. These lessons are going to stand by me as I get on to my work, in a competitive, challenging, at times unreasonable and unfair landscape that the Asset Management firm operates in, and I am sure it will resonate with each one of us in our work area. I had attempted the trail walk in 2013. The daunting trail took me by surprise; it was less of trail and more of treks. Every little injury and exhaustion seemed to be the perfect excuse to give up and that’s what I did, with just about 30km completed. Even signing up for the 2014 Trail walk was a debate with self, fearing failure, questioning the rationale for putting myself through the gruelling ordeal again. Am glad I overcame those doubts, and triumphed at the end of it. At the end of 33km, my feet had busted, my toes were puffing up, the heat had exhausted me completely, and I declared I wanted to quit. My husband, who was my support crew for the trek, reminded me that it was the same place where I had quit the last year, and prodded me to be better than the last year. I decided to step along, and that was the last time I ever contemplated quitting the trail. The trail demanded customised gear to navigate the tricky terrain. My kit bag had Merrell trekking shoes and Nike Pegasus shoes as a backup. I couldn’t think of not having the right shoes to support me through the 100 km. It so turned out my toes started blistering and swelling from 30km onwards, and I couldn’t fit into either of my shoes. Out came my bald Reebok floaters to the rescue, with absolutely no grip to speak of, looking like they were ill suited even for concrete road walk, let alone a daunting trek/trail path. With a bit of trepidation, but a burning resolve to hit the final check point, I completed the remaining 70 km in those Reebok floaters. It is something of a historic feat that I completed 70km of the 100 km in a nondescript floater. The ghost of the previous year, an exhausted body at 30km, a nagging stomach infection over the last 2 years, just the wrong days of the month biologically, just a month’s practice over the weekends before the event, and yet, once I overcame the ‘WALL’ at 30 km, a calm prescience set over me, that all would be well, that nothing would come in the way between me and the final Check Point, that the body was just a willing ally, taking the mind’s orders to carry on, to shut out the aches, and reach the goal. As a team of 4, we were all very different. There was a trained mountaineer amongst us, an avid Himalayan explorer, part of the various rescue crews in the Uttarakhand and Kashmir natural disasters. There was a marathoner, with unending energy and enthusiasm, and there were the 2 of us, moms of 2 kids each, fitness conscious women, with the right intent, but maybe not as evolved in fitness as the rest of the two. What could have been a 24 hour effort for the mountaineer or a 30 hour effort for the marathoner, turned out to be a 37 hour effort for our team. 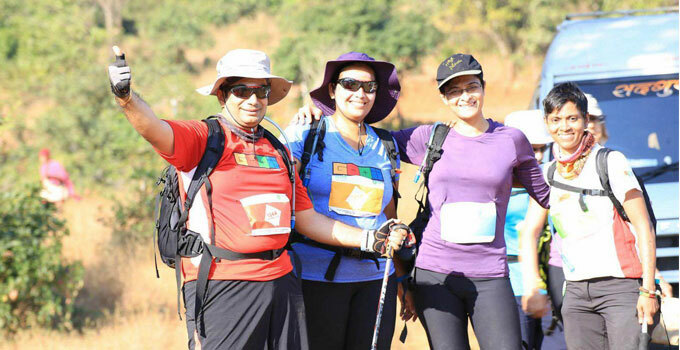 A trail of 100 km sheds the façade and brings out the best and worst of each of us, and it is commendable that the team walked as one, alert and sensitive to each of us, and a full team completion of the trail is by itself a commendable feat. Not many full teams complete the trail. This has been a personality altering, life changing experience for me, and has been a means to prove to myself that someone who had nothing to do with fitness /physical activity as a child can end up being called an Ultra Marathoner if you want it badly enough. The next Oxfam Trail walker is a year away, ample time for all of us to prepare and conquer, any takers ?